Le Marché Nocturne. The summer night markets in French villages, specifically those in the Southwest or Gascon countryside, are something to behold. Next to endless fields of sunflowers, they are one of my favorite things and I try to cram as many into my few short weeks as possible. In fact, these are things I heavily consider in the timing of my visits each year. Nearly every summer evening in July and August, village squares transform into big parties with music, cheap but delicious wine and booths manned with the neighborhood producteurs selling the delicious local specialties. 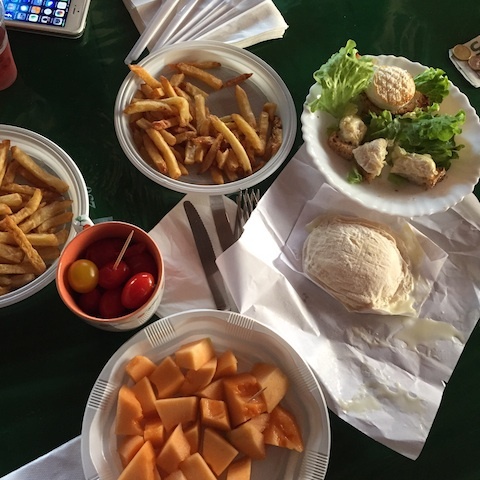 The offerings vary by village but could be platters of melon, local cheeses, bread, duck confit, oysters, big vats of snails, frites (always frites), pastries, grilled sausages and maybe one of my favorites, duck hearts and gizzards slowly cooked in duck fat. We are in duck country after all. The best strategy is to go with several friends so one can stake out a spot at the long tables, one can grab the wine and the rest of the group can scatter to the various booths to assemble a meal. Everyone meets back at the table for a most enjoyable night. It’s really fantastic and I highly recommend you seek them out. One of the first conversations I always have with my friend Kate Hill after I’ve decamped at her lovely home is which night markets we’ll hit that week. After years of vistors, she never seems to tire of these and I don’t either. My favorites, and the ones I’ve been to the most, are Nerac (Tuesdays), Vianne (Fridays) and Le Fréchou (also Fridays). The last one is a tiny little village consisting of family homes and an ancient church, and not much else as I recall. But on summer Friday evenings everyone finds themselves at the big covered open air building on the edge of town, dancing, drinking and eating with their family and neighbors. Given the size of the village, it’s a local occasion with mainly surrounding residents and their friends. Any tourists like myself, typically knows someone from the area as the town is so small I don’t know how anyone could accidentally stumble upon it. This is why these night markets are so delightful. And the food, oh my, the food. In the days leading up to Friday, we make a few calls, rounding up whatever posse we can. 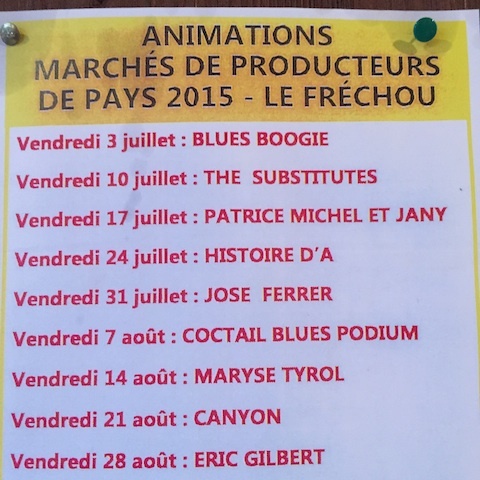 That evening we pile in the car, head for Le Fréchou and look for friends. The Chapolard farm is nearby and Dominique and Christianne are usually on the dance floor, smiling broadly and cutting a rug in the most adorable, enviable way – the dancing butchers – while their nephews sell the farm’s ice cream from their cart nearby. There’s the oyster guy with the short grey dreadlocks and wide grin, the goat farmer we call Marie de Chevre with her delicious goat cheeses, and the stand in the corner with the confit de canard and frites. These have been fairly regular over the last few years and I’m always happy to see them. But this year, there was a new vendor or one I hadn’t noticed before. A husband and wife team who sold tomatoes in various forms. There were bins of fresh heirloom tomatoes, of course, but also a salad of sliced fresh tomatoes with or without a local mozzarella type cheese. 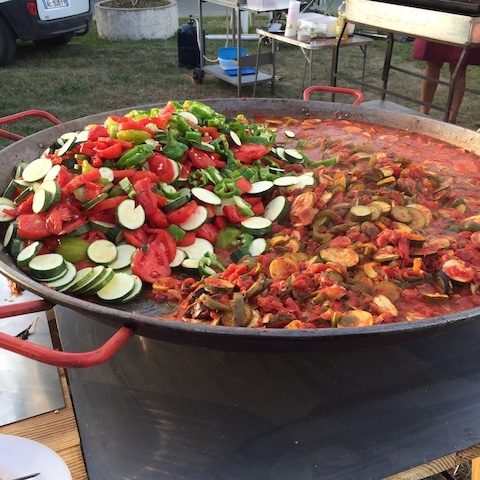 On a portable burner was a giant paella type pan of a sizzling ratatouille. They were also selling something in a mug, little cherry tomatoes in some sort of liquid. Curious, we asked about them and were happily given a taste. They were lightly pickled and popped in our mouths with a bright, sweet-tart flavor. We happily handed over 2 or 3 Euros plus another for a deposit on the mug and wandered back to our table with a handful of toothpicks and a big smile. The tomatoes burst with flavor; a sweet brininess that I couldn’t get enough of. Served ice cold, they were especially refreshing in the midst of that early July heat wave. 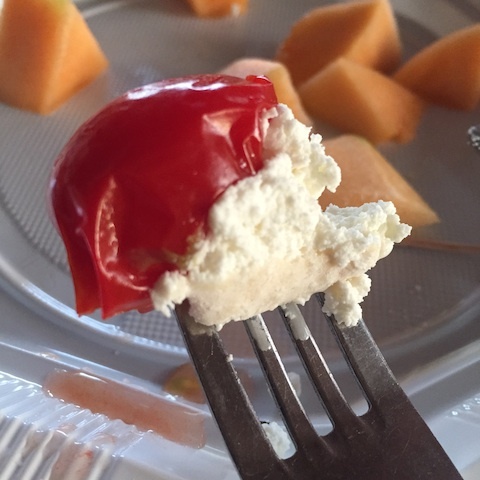 One of our tablemates had bought a baguette and someone else procured a lovely local goat cheese called beret so I took a piece of the bread, smeared it with a bit of the cheese and placed a fat, slighted collapsed tomato on top. I closed my eyes and smiled. It was the best bite of the night. It’s been nearly two months since that evening and I haven’t stopped thinking about those tomatoes. I tried to find that cheese but no one here, including Google, seems to know what I’m talking about. I’m going to happily put that one in that “time/place” category that should only be enjoyed in special circumstances in the right location. I’m OK with that. But those tomatoes. Those I could do especially since my little garden plot is overflowing with cherry tomatoes right now at the rate of about 5lbs per week. I needed to come up with some new ideas and this was definitely one. Turns out it’s a pretty easy recipe, even if you haven’t “pickled” before. A simple white wine vinegar base with some sugar, salt and I added some additional flavorings in the form of chilies, garlic and fresh basil. In a tedious but easy step, I discovered that the results are much more successful if you pierce each tomato a few times with a toothpick to help that brine works it’s way in. Then you just let them sit – a few hours on the counter then overnight in the fridge. Absolutely delicious. STRESS THERAPY BAKING FACTOR: FOR THE HERE AND NOW. What a delightful little cocktail snack! Serve these cold with a bunch of toothpicks for a little party bite or use as the most delicious bloody mary garnish possible. I brought these to the beach last weekend and once people discovered them on the loaded picnic table they were devoured. Someone even asked to take the jar of brine home to make some more. What a compliment. Note: My friend Mardi Michels at Eat Live Travel Write recently wrote a great post about these night markets, specifically the one at Nerac. Check it out. With a vegetable peeler, cut a long swath of zest from the lemon, approximately 3” x ½”. In a small saucepan, combine the vinegar, water, salt, sugar and lemon peel. Bring to boil, stirring to dissolve sugar and salt. Remove from heat and let cool 5 minutes. The brine should be warm but not hot or completely cooled. 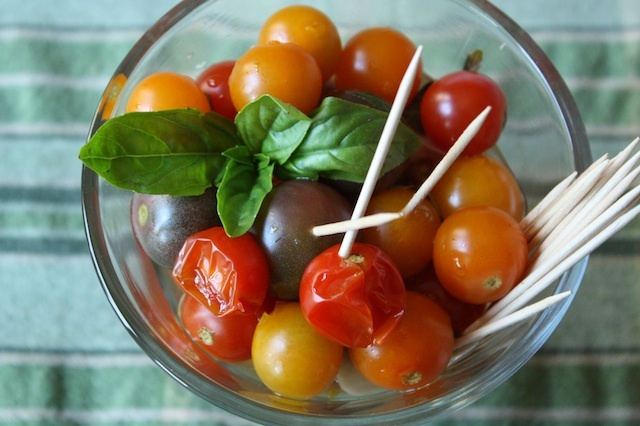 Pierce each tomato 2-3 times with a toothpick to help the marinade soak in. 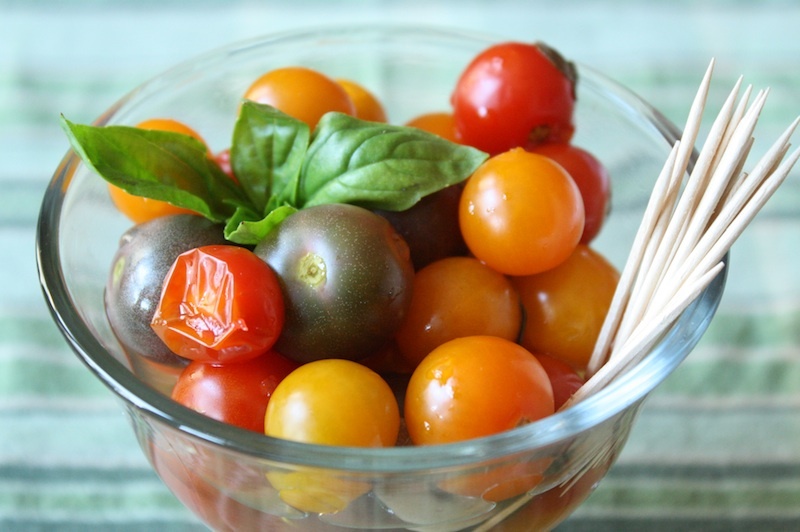 Toss tomatoes, basil, garlic, and sliced chilies in large bowl to combine. Add the warm vinegar mixture. Let stand at room temperature at least 2 hours then refrigerate 8 hours or overnight. Serve chilled with a stack of toothpicks with some cold, cold cocktails. A chilly martini is particularly nice. 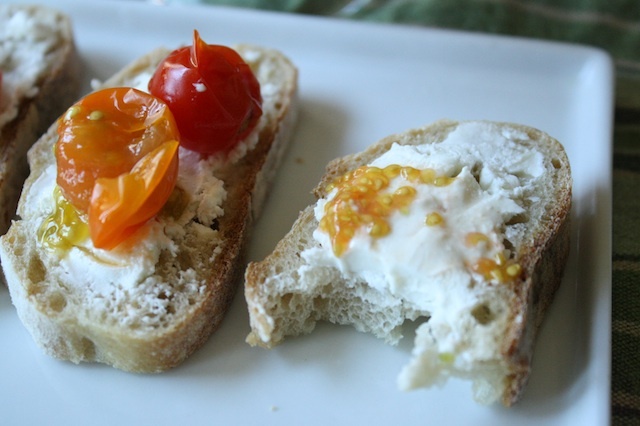 Or for a more substantial snack, add some sliced baguette or focaccia and a little goat cheese if you like. There’s a restaurant here that serves pickled tomatoes, ricotta, and olive tapenade with crusty bread. 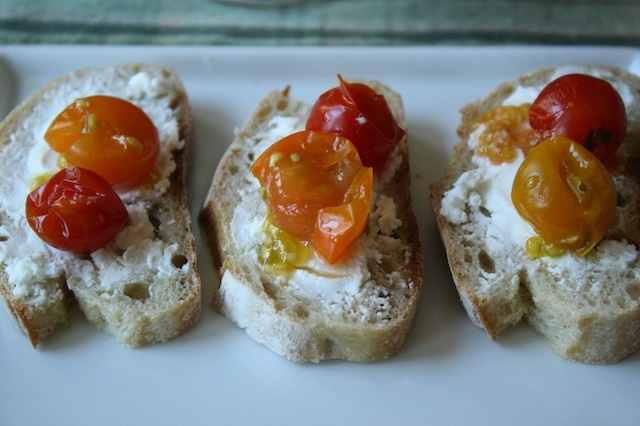 Smear the ricotta, tapenade, and top with the tomatoes. So good! It’s a go-to for Stein and me. Also, the tomatoes are skinless. I read a few recipes that blanched/peeled the tomatoes. Oh hell no. My objective is to use as many tomatoes as possible before the next batch rolls in. I can’t even imagine taking the time to peel them too. ha! And truthfully, the skin was fine, gave them a nice little pop. Ok – TOTALLY making these this weekend!!! I too was thinking about these last week so it’s serendipitous that you posted this recipe. Vive le marché nocturne! PS: did you serve them in a dinky mug (1€ deposit)? !